New developments mean new issues for natural storm drainage, causing flooding in homes and businesses. When your home has a flooding issue, it is a good idea to check a few things like the foundation of your home, the flood plane for your area and what kinds of storm drainage are used on and around your property. This means consulting with professionals about your system and keeping it maintained to get the most benefits and the least amount of flooding. 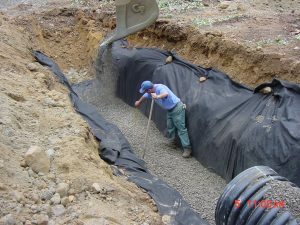 Storm drainage is designed by engineers and maintained by a combination of the municipality and local homeowners depending on the type of drainage. For example, you are likely to have a slope to your property leading to storm drains along the road and your gutters will likely drain into this system. When you are making big changes to your property, putting in an addition for example, you will need to contact an engineer to go over how your design affects the drainage systems in that area. Proper drainage requires proper maintenance. This means that you will need to know what routine maintenance looks like for your system and who can perform it. For example, one of the most visible forms of maintenance is cleaning out your gutters on a seasonal basis. This means checking those seals, removing debris and applying any necessary repairs. You can hire a professional to give your systems a thorough check-up and routine maintenance to help you save time and effort. Storm drainage systems are usually designed by professionals at the state or local level and can be affected when you make changes to your home and property. This is why it is important to consult with an engineer before tackling things like home additions or even extensive landscaping. You can help maintain your part of these systems with the help of professionals and routine maintenance.